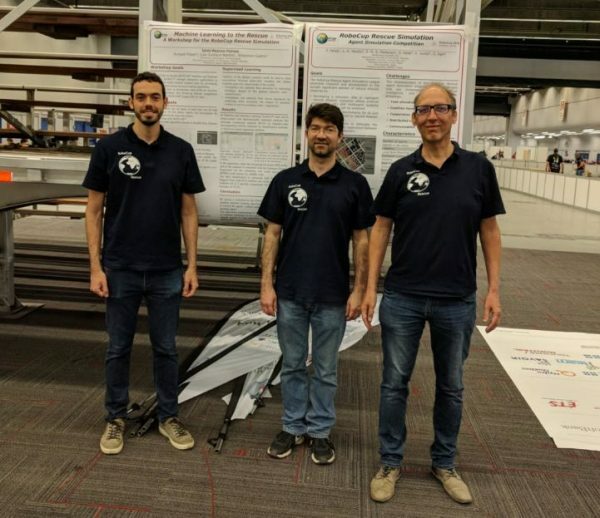 MathWorks was recently at RoboCup 2018 in Montreal, Canada. Over the 7 days of this event, we got a lot done. In this post, Sebastian Castro will discuss one of the collaboration efforts he worked on. All RoboCup major leagues strive to provide a platform for advancing robotics research. 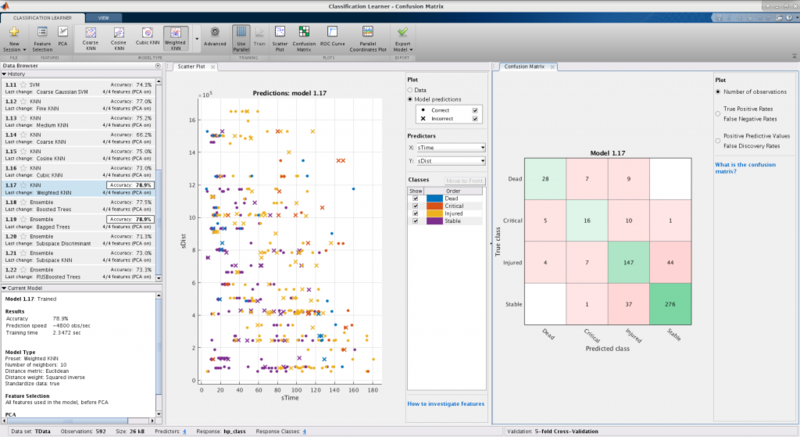 Autonomous behavior and decision-making is increasingly driven by machine learning, and it so happens that MATLAB contains design tools, models, and other functionality for machine learning. As a result, we decided to try integrating MATLAB with the RoboCupRescue Simulation (RCRS) Server using their Agent Development Framework (ADF). Both of these tools are written in Java. After some time working together, both remotely and at the RoboCup German Open 2018 (Magdeburg, Germany) we came up with a solid proof-of-concept and the idea to deliver a workshop for competition participants. In RoboCup 2018 (Montreal, Canada) we presented a 2-hour “teaser” workshop, had a poster, and won 1st place in the RoboCupRescue Simulation Infrastructure competition! Now, we want to share our work with you. Just as we began our workshop, we will begin with an extremely high-level picture of what Machine Learning is, and how it fits in with its commonly associated buzzwords: Artificial Intelligence and Deep Learning. In the context of robotics, we present the following summaries. Artificial Intelligence: Describes a broad set of problems, where an agent has information about the environment and automatically takes action to achieve a goal. Deep learning: A subset of machine learning, which specifically uses neural networks as mathematical models. “Deep” refers to a neural network with many layers, and is a nod to the recent resurfacing of large-scale neural networks due to the computing power available nowadays. Regardless of the machine learning algorithm or model selected (see the next subsection), the same set of tools can be used to solve many types of problems. Below are the four main types of machine learning problems for robotics. Recall that machine learning is defined by the fact that it relies on data. The basic idea is: we provide data to the agent and it forms a generalization, or model, of the problem it needs to solve. A good machine algorithm will be able to accept new, independent data, and correctly solve this problem. Since the data is labeled, it is possible for humans to validate models by checking whether the trained model correctly identifies labels on independent test data. The agent repeatedly interacts with a physical system (simulated or real-world), evaluates its reward, and learns to maximize it over time. NOTE: Deep learning is not a type of algorithm, but rather describes the type of model used by the agent. For example, you might see the term “deep reinforcement learning”. This means that the agent is applying reinforcement learning to tune parameters for its internal deep neural network model. Now that we’ve briefly introduced machine learning, let’s discuss what we did with RoboCupRescue Agent Simulation. All agents must navigate the roads in a city map to get to their targets. These maps are typically represented as undirected graphs. Graph search is considered an AI problem, but not a machine learning problem since no generalization to new data is required — you simply search over the whole map. We implemented two alternative solutions for working with graphs: using MATLAB graph objects and graphs from Peter Corke’s Robotics Toolbox. Suppose that your police force consists of 5 police agents. You want to assign different “zones” to them so they can evenly distribute all the tasks that need to be done within the map. How do you position and dispatch your police agents so they can respond to blockades as quickly as possible? Many teams are already doing this using clustering, which is a type of unsupervised learning. 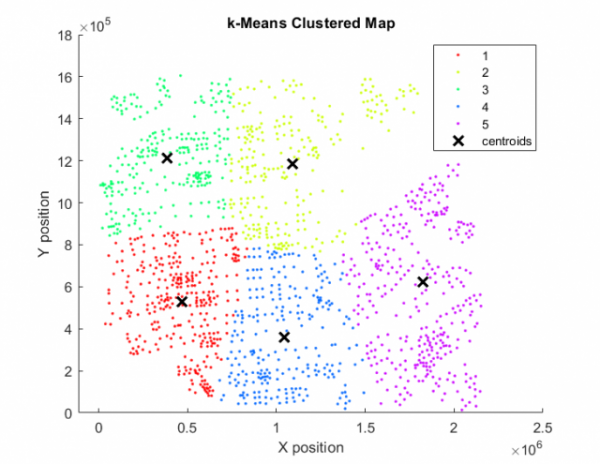 There are many built-in functions for cluster analysis in Statistics and Machine Learning Toolbox. Now for the final example. Suppose you are an ambulance agent and you are faced with a very uncomfortable, but perhaps realistic, decision: If you have 3 injured civilians to rescue, and some information about them, how do you decide which one to save first? 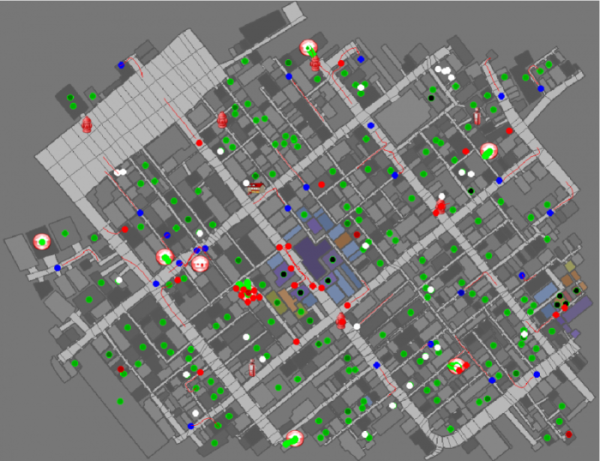 An autonomous agent could use this information to make future predictions and prioritize which civilian to rescue, with the intent of maximizing the overall score of the rescue team. For example, the agent could favor rescuing agents predicted to be in a critical state, but still survive the rescue mission. For the input data, we first used the Import Tool in MATLAB to read spreadsheets and automatically generate a MATLAB function that converts the data to a table. We could then employ techniques such as dimensionality reduction or feature selection to reduce the amount of input data needed to train a model and make a prediction. Ideally, this would lead to a more computationally efficient model, with little to no impact on prediction accuracy. The Classification Learner and Regression Learner apps allowed us to try different types of models and find the one with the best accuracy. Then, we could export our trained model and use it to predict on an independent test data set. If the test accuracy was good enough, we could integrate this model into the simulator so each agent could make predictions on new simulation runs. Classification Learner app showing multiclass predictions and confusion matrix for our sample data set. We got a maximum accuracy of 78.9% with K-Nearest Neighbors (KNN), which is far better than the 25% we could get from random guessing. 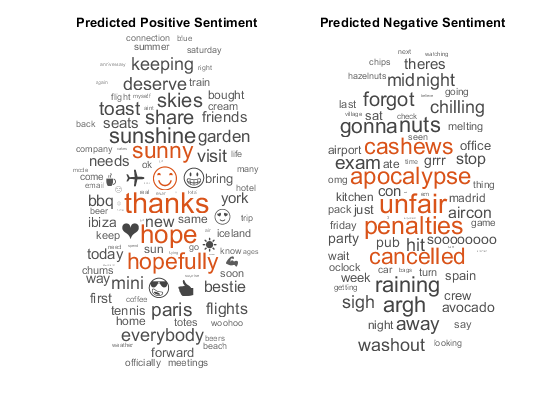 NOTE: We also tried deep learning on this dataset (because, why not?). Since we had a small number of data points and features, and all features were scalar, numeric data, we did not gain much accuracy from the added complexity and nonlinearity of neural networks. However, our repository includes deep learning examples and we encourage you to try them and improve on our work! Finally, we wanted to discuss integrating the MATLAB based machine learning work with the Java based simulation framework. The MATLAB Engine API for Java lets you call MATLAB code from Java, and pass information between MATLAB and Java, provided that a MATLAB session is currently open on your machine. This was a good first step for prototyping, and we were able to demonstrate this worked with path planning, resource allocation, and target selection tasks from the previous section. By the way: the MATLAB Engine API is available in many other languages as well, including C++ and Python. Refer to the MATLAB documentation for more information. This approach worked during the precompute step of simulation, but would not scale well to multiple agents because it would require a large number of MATLAB sessions and/or multiple agents trying to access the same shared MATLAB session. Also, there are security/cheating concerns because, after the precompute step of simulation, agents are not allowed to share data with each other. Using MATLAB Coder, you can generate portable C/C++ code from the algorithms we described above. This could result in code only, or the code could be automatically compiled into an executable or shared library/object (depending on your operating system). The best approach we found was generating a shared library and then calling these from each independent agent. No need to have even a single MATLAB instance open, the generated C/C++ code may run faster than the MATLAB code, and there is no need to worry about agents sharing data because each of them will load the library separately. One small hurdle: Calling C/C++ code from Java requires the Java Native Interface (JNI). Luckily, there are tools available such as Simplified Wrapper and Interface Generator (SWIG) that can do the work for you. Reach out to us if you want to know more. In this post, we introduced our own definition of machine learning and some of the common problems and algorithms associated with it. Then, we showed how MATLAB helped us go from design concept to integration with an external software framework… including all the design explorations and tradeoffs we performed along the way. Our resources are all available online. You can download our code, read our paper, and access our presentation. 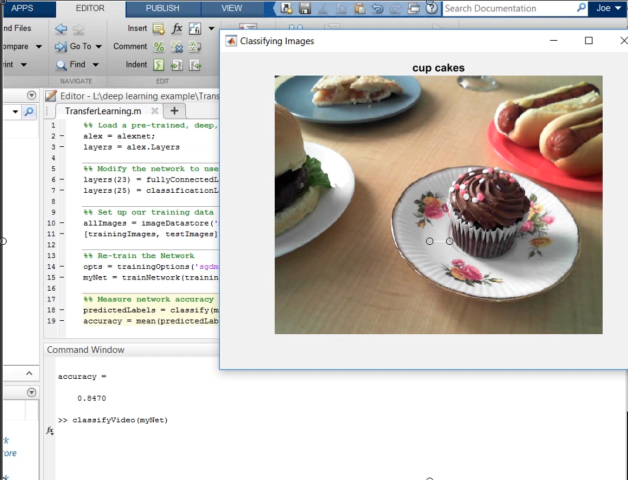 Hopefully, we’ve shown you some new things you didn’t know MATLAB could do. If you participate in RoboCup, we hope to see you in an upcoming workshop. Else, we would still like to hear from you in the comments! When will be this MATLAB coder available for Matlab Home Edition ? @Timofte Bogdan: Unfortunately, the "Coder" products are currently not available for MATLAB Home. If you participate in a student competition like RoboCup, the complimentary license does contain these tools. 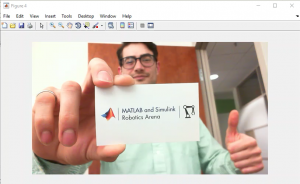 If you are, feel free to email us at roboticsarena@mathworks.com and we can help you get started.